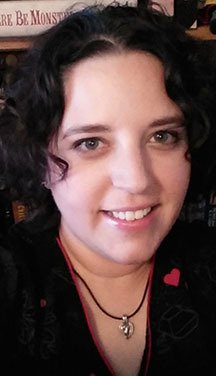 Arlana Kurtz is a writer of speculative fiction. She cut her teeth early on horror, fantasy, and sci-fi with C.S. Lewis, the Goosebumps series, and the movie Poltergeist (which she called ‘Polka-Dot’. She was five). In 2011, she returned to school and earned her BFA in Creative Writing in Entertainment from Full Sail University. She is a member of Second Draft, a local writing group who are determined to write in every library in the city. She lives in Louisville, KY with her husband and two kids. She is currently working on her first novel, a fantasy, and various short stories. You can find her on Facebook and Twitter @ArlanaKurtz. WOW: Congratulations on being a runner up in our Summer 2016 Flash Fiction competition with your story Touch of a Lie! Where do you find the time? After reading your bio, I’m exhausted. How do you balance mom life, a writing career, and all the other demands on your time? ARLANA: Balancing is a hard act. I’m honestly not sure if it’s even possible! I’m fortunate enough that my kids are older (14 and 15), so there’s a lot of driving them around and waiting. I try to do as much writing as possible in those times. As long as I have my headphones, music, and at least a notebook and a good pen, I can pretty much write anywhere. With my job, I work four ten-hour days, so I have three days off. In theory, it means I have three days of writing time. In reality, well, let’s just say I’m trying. Some weeks will be good and I’ll accomplish quite a bit, and then other weeks, I’m lucky if I get a grocery list written. Instead of getting mad at myself for not writing, I start over. What can I do today? For me, it’s not so much about balance as it is about learning how to set up and follow through with a daily schedule. I have a monthly calendar at my desk with monthly goals written out. They usually consist of a daily word count for my novel and a goal for whatever short story I’m working on, as well as social media and blog posts. Jamie Raintree has an excellent Writing and Revision Tracker on her website (http://jamieraintree.com) that I love. It’s so easy to use and really organized. I highly recommend it! WOW: Sounds like you are always busy – working on something. Tell us more about the novel you are working on. When do you expect it to be ready? What are your plans for publishing? ARLANA: My novel is a fantasy called Technically Magic. I got the idea during a genre class I was taking in 2012. At first, it was a sort of fantasy Romeo and Juliet, where Romeo was from a sci-fi world and Juliet was from a fantasy world. I really wanted to know how those people would mesh. The story evolved from there and now focuses on a whole group of people. There’s a quest and even a dragon. I’m currently working on the second draft and plan to go through a few more drafts before sending it out anywhere. I’m hoping to have it finished and ready to go by the middle of 2017. As far as publishing goes, I haven’t totally decided. Self-publishing seems to be the most lucrative, but I’m hesitant. I’ll do more research and make that decision when I actually have a completed manuscript. WOW: I admit it, I did my homework on you Arlana. If you don’t mind my asking, your writing group, "Second Draft" sounds like an interesting group. What drew you to this particular group and what are your thoughts on writing groups in general? What is important to you when looking for a group? Any tips on what to avoid? ARLANA: The Second Draft Writing Group is awesome! I am a passionate advocate for good writing groups. We meet two to three times a month at local libraries and do all of our communicating through Facebook Messenger. Most of these people I’ve known for years through other writing groups and, for one reason or another, we split off and formed this group. We mostly write different genres and we trust each other. Our focus is on making the story better, not cutting each other down. I think writing groups are very important as a writer. When looking for a group, see if you can check it out first before you commit. Look for things like how they provide feedback. Is it helpful? How in depth is it? If you need help with a specific thing (such as dialogue), can you talk about just that? It’s really about finding a group of people you trust that challenges you to grow as a writer. WOW: Talking about trust and how important it is; those we trust are often most influential. Who has been most influential in your writing career? ARLANA: I’ve been writing most of my life and my family and friends have always been supportive. I have a few writer friends and a sister that I send stuff to read and give me feedback outside of my writing group, and that helps tremendously. Besides family and friends, the books I read, movies I watch, and music I listen to, mostly influence my career. Stephen King is one of my favorite writers, and although I didn’t start reading him until I was in my 20s, he was a guiding light in shaping how I wanted to write. He’s great at constructing a story and sucking you into that world. Neil Gaiman is another writer I studied in college because he has his hands in a bit of everything: novels, short stories, and television and comic scripts. I want to do that! The biggest thing that’s recently shaped my career is the 2016 Imaginarium Conference in Louisville, KY. It was three days of nothing but panels for writers by writers. The writers ranged from strictly self-published to a mix of traditional and self-published. They talked about everything from having a social media presence to writing short stories and so much more. It was the first time I’d really seen or talked to real working writers. It was a tangible moment for me, kind of like seeing the behind the scenes workings of a play. WOW: Advice from fellow writers seems to be incredibly helpful in moving us forward as well as helping boost our self esteem. What advice do you have for young writers? ARLANA: For the young writers out there, know that a writing career is hard, despite how easy it is to put a book online. There’s a lot more to it than just sitting with your notebook or laptop and writing a story. You have to be willing to learn the craft side, too. The grammar, the dialogue, the structure of a story. Nowadays, you have to know how to sell yourself as a brand. My advice is to take a few marketing courses. Learn as much as you can. Be open to ideas, but trust your gut when that idea feels wrong for your story. Read. A lot. Everything you can get your hands on. My sisters and I would fight over the cereal boxes because I wanted to read them. Don’t be afraid to make waves or to put yourself out there. Jump at opportunities when they arise, no matter how scared you are. Accept that you are going to fail at some point, but that’s okay. Just keep going. You have to put your time in. And, of course, join a good writing group, even if it’s one you start yourself. It will make all the difference in your writing. WOW: Thanks so much for chatting with us today, Arlana! Best wishes to you on Technically Magic and all your future projects! Crystal--Thanks for posting this interview. Arlana--I read "Touch of a Lie" and certainly did not expect that ending. Wow! Good luck with "Technically Magic." I'm sure, once you get through all the drafts, you'll make the right decision--publishing route-wise--for you. Sioux - talk about surprise endings, right?